Lateral ankle sprains are some of the most common injuries presenting to the podiatric office, especially to the sports medicine focused practice. Although most heal uneventfully with conservative care and physical therapy, chronic ankle instability is not an unusual sequela. This can be frustrating to the patient who is eager to return to his or her physical activity. Recurrent ankle sprains and lingering instability are common reasons for delay in return to activities and may ultimately necessitate surgical intervention. In looking at 117 functionally unstable ankles, Vaes and his colleagues found mechanical instability in only 41 ankles.2 If the sensorimotor control system of the ankle remains intact despite the injury to the ligaments, a patient may not experience the instability usually associated with an ankle sprain.1 When the instability becomes severe enough, surgery is an excellent treatment option with reproducible results. One of the most tried and true surgical procedures for chronic lateral ankle instability has been the Brostrom-Gould procedure. Generally, one makes a curvilinear incision along the distal aspect of the fibula. Often, injury to the peroneal tendons necessitates extension of the incision up the posterior aspect of the fibula for examination and possible repair of the tendons. Identify the peroneal sheath and incise it to retract the peroneals in order to gain visualization to the calcaneofibular ligament. Then incise the extensor retinaculum to reveal the attenuated or torn anterior talofibular ligament. Reflect the ligament off the distal fibula and reef this ligament up with FiberWire (Arthrex) or an equivalent suture material. Suture anchors may augment the repair. Cho and coworkers compared postoperative success of the modified Brostrom procedure using one versus two suture anchors.3 They found that both options provided an effective means of repair with little difference in either clinical or subjective outcomes. The study did reveal slightly more reduction in the talar tilt test postoperatively in the double anchor group. If an injury to the calcaneofibular ligament is also apparent, one can include this in the repair. Advance the extensor retinaculum proximally over the repaired ligament. At the University Foot and Ankle Institute, our preferred method of ligament repair is inserting two suture anchors into the fibula and repairing the ligaments with FiberWire suture. We then pass the sutures through another PushLock Anchor (Arthrex) and secure them slightly more proximally into the fibula for added security. Some manufacturers are now developing systems that further augment the repair of the ligaments. For example, the InternalBrace™ system (Arthrex) has recently become a popular method by which to add strength to the ligament repair. This system uses a thick band-like composition of FiberWire, called FiberTape (Arthrex), in conjunction with both an anchor in the fibula and in the talus to recreate the anatomy of the anterior talofibular ligament. Further controlled studies are necessary to test the true benefit of this system but anecdotal reports have been promising, especially in regard to earlier return to rehab and activity. We now recommend performing ankle arthroscopy with virtually every lateral ankle stabilization procedure. Considering the injury mechanism, it is not uncommon to note other coexisting pathologies, such as osteochondral lesions and anterior tibiotalar impingement. In addition, synovitis and degenerative changes are not infrequent consequences following recurrent trauma to the ankle. Arthroscopy allows for treatment of any of these findings and contributes to the overall improvement of patient symptoms. In their study, Komenda and Ferkel examined the use of arthroscopy and lateral ankle stabilization in 52 ankles with chronic ankle instability.4 They found that 93 percent of the ankles exhibited intra-articular pathology. The most common arthroscopic finding was synovitis, followed by the presence of loose bodies within the joint. There was a 25 percent incidence of chondral injury. Other than synovectomy and excision of loose bodies, other procedures surgeons commonly perform include the drilling of chondral lesions, removal of scar tissue and adhesions, resection of osteophytes and clean up of the lateral ankle gutter. With the recent trend toward minimally invasive procedures, some authors have advocated repair of the ligaments via arthroscopic technique. Cottom and Rigby describe using the typical anteromedial and anterolateral portals of the ankle scope to perform the repair arthroscopically using two suture anchors.6 A percutaneous entry point along with a Micro SutureLasso (Arthrex) assist in capturing the ligament, capsule and retinaculum. Cottom and Rigby evaluated 40 patients who had arthroscopic lateral ankle stabilization. The improvement in patient symptoms was statistically significant and the return to weightbearing averaged 20 days. Oloff and colleagues also describe the use of thermal stabilization via arthroscopy in a small population study of 10 patients.8 Although the study did not find improvement in talar tilt to be statistically significant between pre- and postoperative evaluations, the anterior drawer measurement reduction was significant. The American Orthopaedic Foot and Ankle Society (AOFAS) scores of patients improved from an average of 58.3 preoperatively to 88.1 postoperatively, and the return to full activities occurred at an average of three months. One can also perform reconstruction of the lateral ankle complex using tendon grafts. Since direct repair of the ligaments partly relies on the damaged tissue to sustain the load of the repair, using a tendon graft further reinforces the reconstruction. This can occur either via anatomic or non-anatomic repair of the ligaments. Anatomic repair allows for the preservation of normal anatomy and joint kinematics. This type of repair also permits close to normal range of motion and function of both the ankle and subtalar joints.9 Non-anatomic repair, on the other hand, does not restore the ideal function of the ligaments. Therefore, the primary downfalls of these reconstructions have been an alteration in the kinematics and biomechanics of the ankle joint as well as a loss of subtalar joint motion. The commonly described procedures such as the Evans, Chrisman-Snook and Watson-Jones procedures have largely fallen out of favor for these exact reasons. They have been replaced more recently with either autograft or allograft tendon transfer procedures that more closely follow the anatomic alignment of the ligaments. Common grafts include the peroneal tendons, semitendinosus, fascia lata, plantaris and gracilis tendons.9 The main advantage of using the peroneal tendons when autologous graft is preferred is that a secondary operative site is not needed. Budny and Schuberth describe using a split peroneus longus graft to recreate both the anterior talofibular and calcaneofibular ligaments.10 Transect the peroneal tendon in half proximally. Then route the tendon through the calcaneus and fibula, and secure the tendon to the talus with an anchor. The authors performed a retrospective study of 25 patients and found that 92 percent had good to excellent results. The same percentage reported no further ankle sprains or difficulty with downhill walking. Janis and colleagues assessed a group of 23 patients who had lateral ankle stabilization.11 Three of the patients had bilateral ligamentous repair. There was primary delayed repair of the lateral ligaments in 16 ankles while the remaining 10 ankles had secondary reconstruction consisting of a split peroneus brevis tendon transfer due to severe insufficiency of the native ligaments. Overall, the postoperative improvement rate of the first group was 90 percent while the second group reported an average improvement rate of 82 percent. The average return to full activity in both groups was 10 weeks. Lateral ankle stabilization utilizing tendon graft reinforcement is also an ideal procedure for any failed primary ligament repair. One should take care to reproduce the anatomic route of the original ligamentous structures. Chronic lateral ankle instability can be a detrimental condition to even the recreational athlete, limiting even everyday activity. Although most patients with ankle sprains recover uneventfully with conservative treatment and proprioception training, many patients continue to suffer from chronic instability and pain. Bracing can be helpful in stabilizing the ankle during sports but many patients are resistant to the thought of lifelong use of a brace. Both primary and secondary lateral ankle stabilization procedures are extremely successful in allowing patients to return to their full activity level. It is also imperative to evaluate the ankle for any concomitant injuries that may need repair at the time of surgery. Dr. Baravarian is an Assistant Clinical Professor at the UCLA School of Medicine. He is the Chief of Podiatric Foot and Ankle Surgery at the Santa Monica UCLA Medical Center and Orthopedic Hospital, and is the Director of the University Foot and Ankle Institute in Los Angeles.Dr. 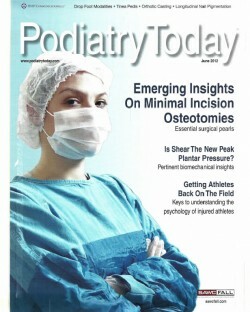 Ben-Ad is a Fellow at University Foot and Ankle Institute in Los Angeles. 1. Richie DH. Functional instability of the ankle and the role of neuromuscular control: a comprehensive review. J Foot Ankle Surg. 2001; 40(4):240-251.2. Vaes PH, Dequet W, Pierre-Powel C, et al. Static and dynamic roentgenographic analysis of stability in braced and non-braced stable and functionally unstable ankles. Am J Sports Med. 1998; 26(5):72-77.3. Cho BK, Kim YM, Kim DS, et al. Outcomes of the modified Brostrom procedure using suture anchors for chronic lateral ankle instability- a prospective, randomized comparison between single and double suture anchor. J Foot Ankle Surg. 2013; 52(1):9-15.4. Komenda GA, Ferkel RD. Arthroscopic findings associated with the unstable ankle. Foot Ankle Int. 1999; 20(11):708-13.5. Van Dijk CN, Bossuyt PM, Marti RK. Medial ankle pain after lateral ligament rupture. J Bone Joint Surg. 1996; 78(4):562-567.6. Cottom JM, Rigby RB. The “all inside” arthroscopic Brostrom procedure: a prospective study of 40 consecutive patients. J Foot Ankle Surg. 2013; 52(5):568-574.7. Hyer CF, VanCourt R. Arthroscopic repair of lateral ankle instability by using the thermal-assisted capsular shift procedure: a review of 4 cases. J Foot and Ankle Surg. 2004; 43(2):104-109.8. Oloff LM, Bocko AP, Fanton G. Arthroscopic monopolar radiofrequency thermal stabilization for chronic lateral ankle instability: a preliminary report on 10 cases. J Foot Ankle Surg. 2000; 39(3):144-153.9. DiGiovanni CW, Brodsky A. Current concepts: lateral ankle instability. Foot Ankle Int. 2006; 27(10):854-866.10. Budny AM, Schuberth JM. Autologous split peroneus longus lateral ankle stabilization. J Foot Ankle Surg. 2012; 51(5):588-592.11. Janis LR, Kittleson RS, Cox DG. Chronic lateral ankle instability: assessment of subjective outcomes following delayed primary repair and a new secondary reconstruction. J Foot Ankle Surg. 1998;37(5):369-375.